We invite you to learn about the eye disease and the importance of regular eye exams, proper diagnosis, and appropriate treatment options in managing glaucoma and preserving vision. Safe: SLT is not associated with systemic side effects or the compliance and cost issues of medications. Selective: SLT utilizes selective photothermolysis to target only specific cells, leaving the surrounding tissue intact. Smart: SLT stimulates the body’s natural mechanisms to enhance outflow of the fluid in your eye. Sensible: SLT therapy is reimbursed by Medicare and many other insurance providers, which minimizes your out-of-pocket expenses. SLT does not rely on medicines, instead, uses an advanced laser system to target only specific cells of the eye—those containing melanin, a natural pigment. This allows for only these cells to be affected, leaving surrounding tissue intact. As a result, your body’s own healing response helps lower the pressure in your eye. SLT stands for Selective Laser Trabeculoplasty. This is a non-destructive laser procedure used for glaucoma treatments by reducing the pressure in the eye. How is SLT performed ? SLT is an outpatient procedure. You will sit in a conventional exam chair, where the doctor will use a slit lamp to examine your eye. The same slit lamp contains the SLT laser. During the procedure, the doctor will put anesthetic drops in your eye to numb it, and then place a lens on your eye for better viewing. The laser is applied to the edge of your pupil. The entire procedure only takes a few moments. There is no sensation associated with an SLT procedure. You will require follow up visits with your doctor to monitor the success of the SLT treatment. How often do I need to receive SLT for treating glaucoma ? One application typically lasts for many years. Depending on your individual circumstances and goals, another application may be needed at some point in the future. How does SLT works ? SLT works by using laser light to stimulate the body’s own healing response to lower your eye pressure. Using a special wavelength and energy, the laser affects only pigmented (melanin containing) cells of your eye. SLT improves the flow of fluid in the eye, which in turn lowers your eye pressure. Is SLT right for me ? Only your doctor knows what is best for your individual needs. SLT may be the right glaucoma treatment option for you, simply ask your doctor to find out more. Does SLT work for all types of glaucoma ? There are different types of glaucoma and glaucoma patients. While SLT works on most, it does not work for all. Your doctor will know the appropriate course of action. Will I still need to continue using my eye drops following the SLT treatment ? Maybe. Each individual is different. Although there is a chance you can eliminate or reduce medications, SLT cannot guarantee this. How long will I have to wait to experience the full treatment effect of the SLT laser ? Glaucoma patients can respond as soon as an hour after treatment, or as much as a few months later. Continued monitoring and follow up with determine the response of therapy. How long is the recovery ? The doctor may treat your eye with anti-inflammatory eye drops that will be continued for a few days after the procedure. Glaucoma patients have no limitations after the treatment and are able to drive home. Your doctor will schedule a follow up appointment to evaluate your results. 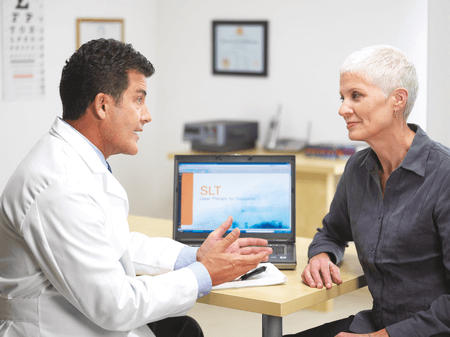 What are the SLT laser side effects ? Though infrequent, possible SLT side effects may include inflammation, temporary increase in eye pressure, eye pain, or inflammation of the conjunctiva, the clear membrane that covers the white part of the eye. Consult your physician regarding contraindications and risks.